The exhibition and the book Half a World Away; PostWar Migration To The Orange District 1948-1965 is the culmination of a heritage study drawing together the people of Orange, the NSW Migration Heritage Centre and Orange City Council. This web exhibition is drawn from the research and the exhibition held at the Orange Regional Gallery in March 2007. Today, four out of ten people in New South Wales are either migrants or the children of migrants. As former migrants age, it is vital their stories and cultures are recorded. Since the 1830s, migrants have made a remarkable contribution to the settlement and development of Orange. Following the Second World War, many migrants from Europe made their home in Orange, transforming the economy, culture and landscape of the city and its surrounds. The arrival of the first World War II European migrants in the Orange district in 1948 heralded significant changes in the life of the city. As the newcomers found jobs, built homes and settled into their new lives, the city developed with them. During the next two decades, when post World War II migration to Australia reached its peak, Orange expanded from a quiet centre of about 14,000 inhabitants to one of the most dynamic and successful cities in inland NSW. 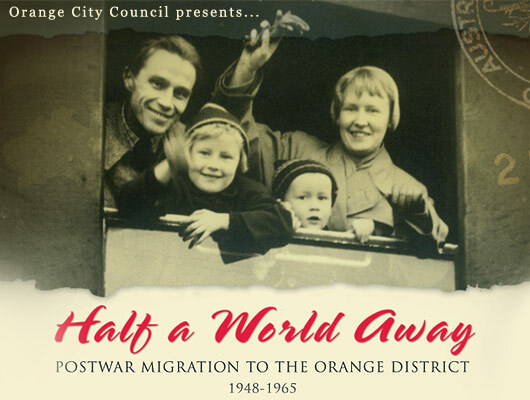 Half a World Away is a tribute to the hundreds of families from Europe and the United Kingdom who exchanged conflict, uncertainty and economic chaos for a stable, prosperous lifestyle in the Orange district. Their journey was often not an easy one but their spirit and tenacity prevailed and Orange is much the richer for their presence.